Brussels, 24 June 2013: – The European Interactive Digital Advertising Alliance (EDAA) has today announced the approval of two technology platform providers, TRUSTe and Evidon, to serve the “OBA Icon” on behalf of companies delivering online ads across Europe. Today’s announcement makes the provisional agreements between EDAA and the two providers, in place since mid-2012, official. This approval is a significant development for the European Self-Regulatory Programme on Online Behavioural Advertising (OBA). TRUSTe’s “TRUSTed Ads” solution and Evidon’s “InForm” solution mean that companies operating in Europe can be confident that they are using credible, well recognised platforms to let European consumers know when OBA is in use. Providing billions of icon impressions across Europe every month, this official approval of TRUSTe and Evidon as technology platform providers will further guarantee high visibility of the OBA Icon on online ads. 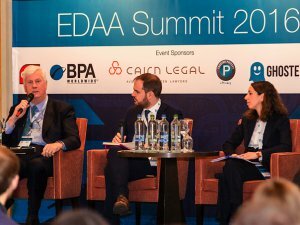 The EDAA is also taking action to increase consumer awareness and understanding of the Icon and OBA more generally, with the launch of “Unzipped”, a pan-European consumer awareness campaign, last week in the UK and now in Ireland. The campaign will be rolled out in Germany next with remaining EU and EEA markets to follow shortly. The European Interactive Digital Advertising Alliance (www.edaa.eu) is a non-profit organisation based in Brussels and is responsible for enacting key aspects of the self-regulatory initiative for Online Behavioural Advertising (OBA) across Europe. EDAA principally acts as the central licensing body for the OBA Icon and provides technical means for consumers to exercise transparency and control over OBA through the online consumer choice platform at www.youronlinechoices.eu. EDAA is governed by EU-level organisations which make up the value chain of OBA within Europe and acts to ensure European consistency in approach. The campaign, which has been designed by Mediacom Beyond Advertising, is based on a concept developed by a team of students at KH Leuven, Belgium, who were finalists in a student competition run by EACA (European Association of Communications Agencies). TRUSTe, the leading global provider of data privacy management solutions, powers trust in the data economy by enabling businesses to safely collect and use customer data across all channels – websites, mobile apps, cloud services, and advertising. Our cloud-based Privacy Management Platform delivers privacy assessments & certifications along with innovative technology products, including website monitoring and advertising compliance controls for desktop and mobile ads. More than 5,000 companies worldwide, including Apple, Disney, eBay, Forbes, HP and Oracle rely on TRUSTe and our globally recognized Certified Privacy Seal to build trust, drive engagement and ensure compliance. For more information, please visit www.truste.eu. For more information, please visit: www.evidon.com.